The original reform plans would have seen the personal injury small claims limit rise from 1k to 5k and the any rights to claim for soft tissue injuries removed. Holly Paley, Accident Claims spokeswoman thinks the news is positive for personal injury claimants. “We think on the whole the decision to shelve reforms is more of a positive. Personally we thought that the proposed personal injury changes could have significantly hindered genuine claimants. Unfortunately in every industry there are always people who manipulate the system and I think we need to come up with better ways to highlight fraud rather than look at a blanket ban altogether. Genuine whiplash claims would have been affected by these reforms and people would have lost the ability to claim compensation for this”. 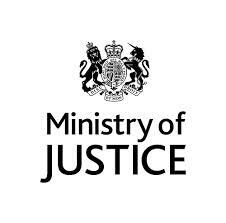 The MOJ have made it clear that the issue of reform is certainly not off the agenda. For the Ministry of Justice the number of whiplash claims are still too high and contribute to the rise in insurance premiums. We’re not convinced as numbers of whiplash claims have fallen dramatically over the last few years, premiums remain the same. There still remains significant support for changes to personal injury legislation and it’s likely that something will be done at some stage. Mounting pressure on government officials and No10 Downing Street means at some point something has to give. It’s important that any implemented changes are based on actually independent evidence and not on the basis of keeping the pockets of insurance companies lined. Follow Accident Claims on Twitter to keep up to date with all the personal injury changes that could affect your ability to make a whiplash claim. This entry was posted in accident claims, referral fees, Uncategorized, whiplash claims and tagged accident claims, personal injury, whiplash claims on October 19, 2016 by . We often talk about the rise in false accident claims, but for the first time, insurers are beginning to win the battle against ‘suspect’ whiplash claims. 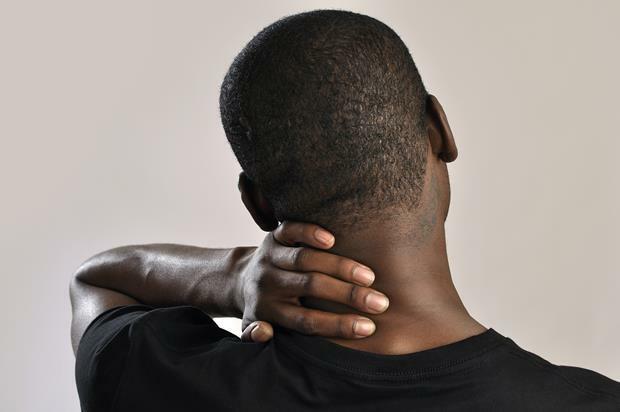 The reduced number of whiplash claims has saved insurance companies over a billion pounds – savings which are yet to be passed on to consumers. The Government’s Compensation Unit has put together figures that show 50% of accident claims made refer to motor related incidents. Statistics also show that the average value of a claim has reduced by £124 to £10,600. The industry has been threatening to get tough on whiplash claims for a while and it now seems they are starting to make progress. 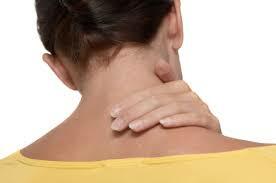 Whiplash is the the term used used for damage to the soft tissue around the neck or back after an accident. One in nine whiplash claims are said to be ‘suspect’ with bogus claims adding an estimated £50 to your already hefty car insurance premium. Speaking to drivers it’s clear that premiums have not reduced and in fact have continued to rise steadily for the past 5 years. Insurers now look to blame other factors after previously attributing rises to the number of false accident claims made. It seems the rising cost of dealer repairs and insurance premium tax are the new ‘culprits’ to your rising premiums. Our consumer champion Holly Paley reiterates her frustration at the latest developments. “The disappointing thing is that consumers have always been told that the number of accident claims made has an impact on the premiums they paid. This data from the Government Compensation Unit doesn’t reflect that claim. If premiums rise as a result of an increase in whiplash claims than surely they should be reducing on the back of a reported 6 percent drop. I don’t personally buy the excuses coming from insurers that other factors are now attributing. We need clear guidance and advice to drivers so that we can all come together in a bid to save. The concern is that if we don’t start to pass on these savings to drivers than we will end up back where we started ,with a rising number of ‘suspect’ whiplash claims”. If you have been genuinely affected by whiplash than speak to the Accident Claims team for no obligation advice. This entry was posted in accident claims, No Win No Fee, whiplash claims and tagged accident claims, compensation, no win no fee, personal injury, whiplash claims on October 7, 2016 by . We’re often laughed at for having the weakest necks on the planet. Many would argue that our weakness is merely the ease of gaining compensation in a place where accident claims are sought after by society. The whiplash claims culture accounts for a massive 80% of personal injury claims that insurance giant Aviva handles last year alone. The UK’s staggering level of whiplash claims is even more alarming when compared to our European neighbors France, where only 3% of claims are associated with neck injuries from a car accident. Car insurance premiums have remained fairly stable over the last few years but the number of whiplash claims no doubt has a significant impact on current premiums. It’s estimated that our ‘weak necks’ account for around £93 of our car insurance premium. In a bid to curb Britain’s compensation claims culture, politicians have played with the idea of stopping whiplash claims altogether, plans which have been stalled since the Brexit decision. So how have car accidents fallen by 40% in the last 15 years yet whiplash claims have increased by 90% in the same period? Are we now facing a different dilemma? While the number of accident claims is reducing, the number of fraudulent claims is increasing significantly. ‘Crash for cash’ scams have in-fluxed the system and have proved extremely difficult to flush out. It’s hard enough to determine whether the injury is real, never mind the accident in itself. Whilst insurance companies express their eagerness for legislation to end whiplash claims, their accounts suggest otherwise. I’ts well known that insurance companies sell accident claims to personal injury solicitors for £500 upwards a case, more than what third party insurance claims are costing them. Changing legislation may never happen as genuine claimants are likely to lose out in the event of trying to make a personal injury claim for whiplash. Interestingly many claimants only pursued their whiplash claims because of persistent pressure and cold calling from accident claims management companies. Isn’t an obvious solution here to properly enforce cold calling bans? The debate will continue to go on, the compensation claims will continue to flood in. What do you think our solution is to curbing Britain’s compensation culture without disadvantaging genuine claimant? Let us know your thoughts on Google+. This entry was posted in accident claims, No Win No Fee, personal injury solicitor, whiplash claims and tagged accident claims, compensation, personal injury, solicitors, uk claims, whiplash claims on October 1, 2016 by . A Bolton based scrapyard has been fined £30,000 after one of its workers, Mr Sparrow, suffered a facial injury that will scar him for life. Accident Claims can reveal that the former Metro Salvage was fined and sentenced after breaches were found in health and safety practices. 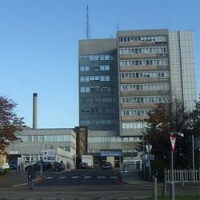 Manchester Crown Court gave its verdict after hearing how the injured employee was wounded while attempting to remove a cars catalytic converter resulting in 40 stitches. Mr Sparrow argues that their employer had instructed him to carry out practices that were deemed hazardous. The scrapyard denied any wrong doing and claim that Mr Sparrow had gone against health and safety policies that he had signed to adhere to. The scrapyard was convicted and charged On the basis that the company had failed to document its health and safety in accordance with legislation requirements. Judge Potter branded the defendant ‘disorganised’ when detailing the lack of risk assessment or training material that was available to employees. 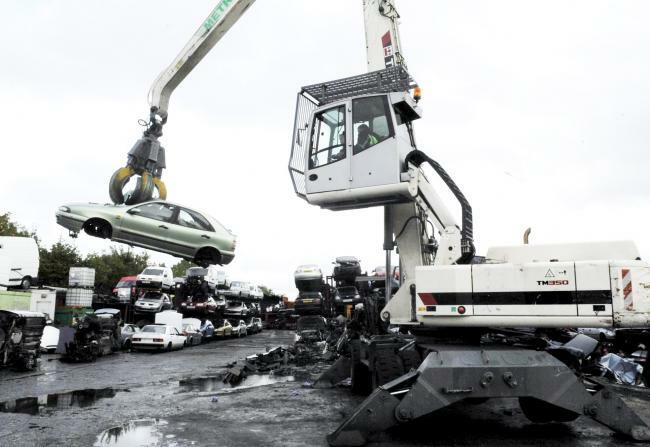 Previous accident claims have been made against the scrapyard, one claimant awarded £12,500 in personal injury compensation after being crushed by a car that was hoisted nearby. Speaking not long after the verdict, personal injury solicitor Kirtana Razid spoke to us. “The case today is just another example of how accident claims against employers can be avoided. When it comes to health and safety you can never have too much documentation. What we are finding is that the majority of employers have little to no documentation at all. The bottom line is that the injuries today could have been avoided if the employer had adhered to legislation. This entry was posted in accident claims, No Win No Fee and tagged accident claims, compensation, no win no fee, personal injury, solicitors, uk claims on September 27, 2016 by . Every Town Needs a Pothole Pete! Accident Claims have great pleasure in introducing you to Plymouth’s answer to Britain’s pothole epidemic, Pothole Pete. A tireless campaigner for the Herald, Pete watches over pothole repairs that are taking place in the city. With the arrival of the ice and the end of the year, repairs will now finish until 2014. Severe potholes notoriously cause damage to vehicles on the road but can also cause accidents. This year accidentclaims.co.uk has recorded the highest number of accident claims as a result of pothole related incidents. Only last month we reported on a motorist who was severely injured after losing control of his moped after going over three concurrent potholes. Compensation claims for pothole incidents are costing councils millions of pounds each year. Whilst Pothole Pete has no official authority, his presence ensures that the council don’t take their foot of the gas in maintaining the city’s roads. Eight thousand potholes have been repaired over a six month period with over two thousand repairs taking place in just three weeks. Accident Claims team leader Holly Paley commented; “Are we ever going to get rid of potholes? No chance! You’re always going to have pothole problems when you have a road network like the UK in constant use. That doesn’t mean we should give up. Councils need to use resources wisely to minimise the problems as much as possible and specifically target problematic areas. If a sensible and thought-out strategy is used we can reduce the number of compensation claims that are occurring as a result”. New technology can mean pothole repairs won’t resurface as quickly. Micro asphalting seals the surface of the road reducing the chances of water entering the hole that ultimately leads to emerging potholes. Will we one day look back at potholes as a thing of the past? This entry was posted in accident claims and tagged accident claims, compensation, no win no fee, personal injury, potholes, solicitors, uk claims on September 23, 2016 by . 2014 has arrived and new changes to EU law could see a huge reduction in the number of airline delay claims that are currently going through the system.Accident Claims, in line with EU law, take on flight delay claims whereby passengers have been delayed for 3 hours or longer. New changes could see the 3 hour eligibility criteria increased to 5 hours leaving some passengers with the inability to claim compensation. Depending on how far you are travelling EU law allows for claims of up to £502 for flight delays that are over 3 hours. Most passengers don’t submit flight delay compensation claims and it’s estimated that only around 2% of travellers who have experienced delays go ahead and make a claim. Airline operators have been criticised for using the ‘extraordinary circumstances’ excuse to escape paying out on legitimate claims. Compensation for delays does not have to be issued if the delay was out of the airlines control e.g. severe weather conditions. Accident Claims frontman Josh Donn commented. “At Accident Claims we recorded 42% of claims being rejected on the basis that the circumstances of the delay were due to extraordinary circumstances. As the rejection process is generic across all operators we are well aware that it’s not the end of the road and we need to give them a real fight to achieve the right result for our client’s. Operators know that if claimants go direct to them and have claims rejected they are less likely to think they can still achieve compensation by continuing”. Problems passengers are now facing are that claims are being delayed. The anticipated change in regulation is likely is see these delays continue as airline operators look to hold off paying compensation on claims which would not be eligible under new legislation. Predominately personal injury specialists, at Accident Claims were committed to fighting your case and ensuring you get the compensation you deserve. We constantly keep up to date with legislative changes to give you the best possible chance of recovering compensation for your loss. For more detailed information on the current flight delay compensation scheme please check out our dedicated flight delay page. This entry was posted in accident claims, Flight Delays and tagged accident claims, compensation, flight delays, no win no fee, personal injury, solicitors, uk claims on September 23, 2016 by . It gives us great pleasure to welcome The National Claims Service to Manchester where they have now officially opened up one of their ‘super’ branches in close proximity to the Accident Claims head office. The National Claims Service (NCS) is a well-known and reputable company offering advice and assistance on any sort of claim against another third party. The NCS also offers free debt management advice. Mainly operating through a branch network of walk-in claims advice bureaus, they also boast a 24 hour claims line covering over 50 cities nationwide. Originally The National Claims Service was established to help combat the thousands of claims management companies that were operating without their client’s best interest at heart. The NCS have a highly respected team who have been involved in every area of the legal industry. 2014 has been a positive start for the accident claims industry after 2013 saw the loss of some high profile firms. 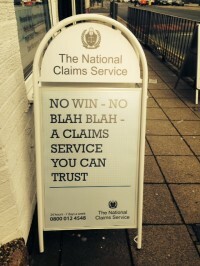 Whist critics argue that the stronger firms in the market are struggling to compete with the ‘no win no fee bandits’, the strong success of The National Claims Service and the Accident Claims brand continue to show that some of the larger players can continue to thrive in an increasingly challenging market. With no new major reforms to the personal injury market it gives firms the chance to settle down after the upheaval of the referral fee ban last year. With the renewal of many Ministry of Justice licenses on the horizon it remains to be seen whether the total number of authorised firms will decline further. 2013 saw a 30% drop in renewals which reflects the period of change. It’s expected there will be a further drop as those who braved a further year to test the water will have found it too difficult to continue. This entry was posted in accident claims and tagged accident claims, compensation, no win no fee, personal injury, solicitors, uk claims on September 23, 2016 by . After years of success in the accident claims industry, our team at accidentclaims.co.uk are delighted to announce the launch of HDCU, the Housing Disrepair Compensation Unit. Starting with the North West, the Housing Disrepair Compensation Unit aims to inform all council and housing association tenants of their rights to repairs and potential compensation. We formed HDCU this year after a rise in the number of council related incidents that appear to have been overlooked and consequently were in breach of legislation. As we operate in different areas of compensation claims we have a large number of existing clients with accident claims, PPI claims etc. We found a large number of our clients were contacting us for advice on their current housing situation, many who were at breaking point with the state of their property and the potential personal injury risks. The surge over the last 3 months meant we had a duty to form something more concrete in order to represent large numbers of clients and to start producing informative literature on housing disrepair claims to educate. In a large number of cases we found a pattern of reported problems not being ‘recorded’ until the tenant had made numerous complaints. Once the council had ‘acknowledged’ the problem they went through an identical process which resulted in no repairs. E.g a tenant reports a problem with their roof which eventually gets someone out to the property. Scaffolding is put up against the property and its identified that the roof requires extensive and expensive repairs – rather than complete the repairs, the scaffolding remains for some time only to be removed with no work undertaken. In some cases we found that eventually the required roof repairs did take place but sometimes years after the problems were reported. Required roof repairs can not only have an impact on your health, but your personal belongings. As well as getting the repair completed, making a housing disrepair claim can result in compensation for other related problems. We’ve teamed up with a number of charities who share the same passion as us – helping their communities, whether financially or just for some advice. Our goals are simple, make people aware and put things right! If you have contacted your landlord within the last 5 years regarding any housing repairs then you may be due compensation. This entry was posted in accident claims, Housing Disrepair and tagged accident claims, compensation, Housing Disrepair, no win no fee, personal injury, solicitors, uk claims on September 23, 2016 by . Scotland’s largest teaching union has revealed they have seen a significant drop in the number of teachers making accident claims at work. Compensation pay-outs for accident claims at school in 2013 totalled £300,000, £1.5m short of that paid out in 2012. Is questionable as to what is the cause for the dramatic fall over the past 12 months. Have employers improved workplaces to the extent that it has ultimately led to a reduced number of accident claims? Maybe it’s just the claims culture that is starting to hit home. The difference between an accident at work and a whiplash claim is that you are claiming against your employer. With more people out of work and a struggling economy, maybe not as many want to risk their relationship with their employer by making a compensation claim against them. Whilst you may never be sacked for making a claim against your company, it would surely leave a sour taste in the mouth of your boss. Not all accident claims at work are down to negligence from the employer and pupil behaviour can often be responsible for staff sustaining injuries. Is there a link between the decrease in claims made by teachers and improved behaviour in school? Some of the biggest and most interesting pay-outs of 2013. -£12,500 after a slip on the floor whilst it was being cleaner – no signs however! It will be interesting to observe accident figures throughout 2014 to see if workplace injuries continue to decline. In the last few years new areas of compensation have emerged which may have had an overall impact on the decision to make a work related claim. PPI claims have been stealing the headlines for the past couple of years and with many consumers getting in excess of 10k it begs the question as to whether they need to claim when they have a minor accident. It’s important to note that a lot of people look for compensation for financial gain. Wouldn’t 10k in most people’s pockets make them think twice before trying to claim 1-2k for a minor work injury? Do you see compensation claims as financial gain we are entitled to or should they be used solely for when you have lost out financially as a result of an injury? This entry was posted in accident claims and tagged accident claims, compensation, no win no fee, personal injury, school claims, solicitors, uk claims on September 23, 2016 by .